The annual Stonesfield Village fete, which raises money for the local primary school. We'll be at the Guides For Brides' fabulous Summer Wedding Fair on Sunday 5th. 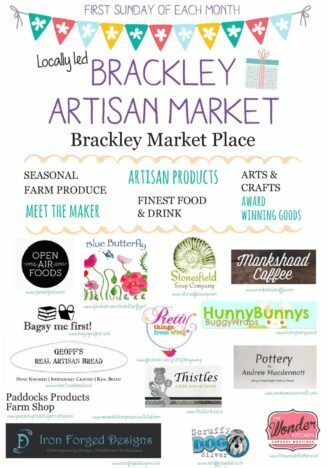 We'll be at the excellent Brackley Artisan Market this Sunday (5th June) from 10.00am - 3.00pm. We hope to see you there! Charlbury Farmers' Market, once every three months on the Playing Close. Located in the beautiful Church of St. Peter & St. Paul, this lovely little craft market runs in tandem with the excellent Deddington Farmers' Market every fourth Saturday of the month (third Saturday in December). Why not pop in to browse the stalls and have a sit down with a tea or coffee. Run by the excellent Mynt Image, this fair is located in Thame Town Hall. Come and browse the wide range of excellent artisan stalls. The market will be held in the character upper hall of the Town Hall. The hall is accessible by lifts as well as easy rising stairs. Quality hand made gifts presented by the makers. A show from talented, skilled crafters and artisans who do what they love, and love what they do. Home made refreshments available throughout. Profits from the day go to Cancer Research and Macmillan Nurses. Accessible by rail to Tackley Station. See the brilliant annual craft bombing as you come from the station! Stallholders are chosen carefully for quality. The Christmas market in the Wheat barn and Barley Barn will have over 30 stalls from local businesses, crafters and makers offering hand-made gifts, rural crafts from textiles to wood, festive decor, garlands made to order as well as local produce, cakes, pies, speciality local beers and ciders, gift bags and hampers from local breweries. Come and find us outside the barn in our gazebo. There will be over 50 amazing local crafters, bakers, artists and photographers all brimming with bespoke wares that can’t be found on the high street. And to provide the perfect Christmas sparkle we also have carol singing with the Speenhamland Ladies Choir, mulled wine and hot food. We'll be at Charlbury again this Saturday for the fabulous Charlbury Farmers' Market. Come and find us, along with many other local excellence companies, on the green at Playing Close, Charlbury. Located in the beautiful church of St. Peter in picturesque Hook Norton, this event is simply fabulous for seeking out the perfect gift. All 40 stalls have been hand picked for the high quality of their products, all of which are handmade by the experienced craftspeople themselves. They offer contemporary & traditional distinctive work for gifts, yourself and for your home. We're back again at Playing Close, Charlbury, this Saturday morning for the final Charlbury Farmers' Market of the year. With a lovely range of fabulous local traders selling a lovely mix of products from cheese to candles and scotch eggs to artisan gin it is a treasure of a Christmas market. We hope to see you there. Cogges Farm Christmas Market is always a fabulous event and we will be back there again this year this coming Sunday, 9th December. With a large number of artisan stalls inside and outside the barn, you'll be sure to find some lovely items to take home with you. Find us in our white gazebo; we look forward to seeing you there. The last Deddington Farmers' Market of the year promises to be the best place to go for your Christmas provisions and for those last minute gifts (and well-earned treats for yourself). Find us with many other fabulous artisan traders at the craft market in the lovely Church of St Peter and St Paul, just across the road from the main market.